This is not advice I am able to give: it’s not what the regulator thinks, but what you want to know about the charity that matters. So this blog is about how you find out what you want to know, based on the idea expressed in our Public Trust and Confidence research this year that people want to know what happens to the money and time they give. And at the same time I’m publishing a blog for charities about what they can do to make sure they are giving the public what they want. Anyone who donates money or time to charity wants to find that it makes a difference and does what the charity said it would do. So how can you judge? You can use our Register. You use a charity name or even better their number, to search for the charity. This first step means you’ve verified they are a real charity on our register. The next step is to look at what the Register says about the charity. We’d suggest that you should consider these factors. 1) How do you know what the charity is doing and what difference it makes? For this, you want to check the Accounts section of our Register page for your chosen charity for the annual report/ accounts (the left hand sidebar), which should explain what the charity is aiming to do, what work it undertook and the impact the charity has had and what they did with their money in the last financial year. If it’s not on our website because the charity is small, the public can ask the charity for a copy of the report and must be given it, (although you may have to pay the administrative costs). Many charities also include additional information on the website. In the example below, Macmillan Cancer support explains in their annual report how many people they reached and supported. 2) What do they spend on carrying out their purposes as opposed to on other things like administration? Under charity law there isn’t a set limit that charities must spend on fundraising or administration costs. The charity in its report should explain why they spend money on these things and how successful they have been. Large or complex charities often need administrative support to ensure the charity is well run and spends money wisely. However, charities with an income of £500k or more have to disclose what they spend on carrying out their purposes, so in many cases you can look at and assess whether you find a charity’s administration or fundraising costs acceptable. You would not expect to find zero fundraising or administration costs except where the charity is very small-scale and run exclusively by volunteers; equally, it would need a very good reason for fundraising or administrative costs to take up more than half of the charity’s yearly income. 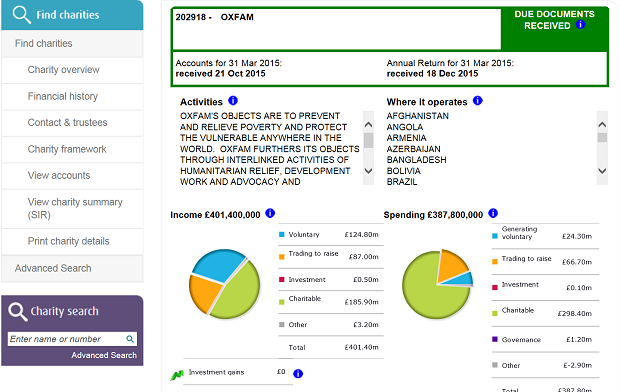 For example, in the financial snapshot for Oxfam below you can see that around ¾ of spending (pie chart on the right) goes on the charitable activities, and you can see the proportion that is spent on fundraising, and governance and investment management (these last two are the costs of administering the charity and looking after its assets). Generating voluntary income and trading to raise funds are ways of ensuring the charity has enough money to carry out its work. 3) Has it filed accounts on time? If it is late filing accounts there will be a red flag saying ‘Documents Overdue' at the top of the page. This is because late filing tends to be symptom of the trustees not running their charity well and underlying governance problems or a lack of openness. 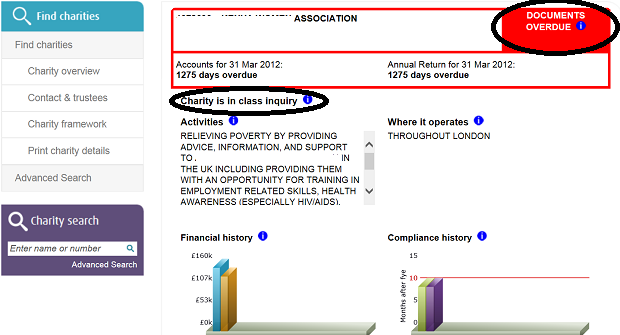 In the example below, a charity is flagged as ‘documents overdue’ on the right at the top, which means they had not filed accounts within 10 months of the financial year end. In this case it is also flagged as in a 'class inquiry' on the left hand at the top, which is a statutory inquiry as it has not filed accounts for more than two years in a row. 4) Are there serious concerns about the charity? In the example above, the Register flags that the charity is in an inquiry; in most statutory inquiry cases this will also be flagged on the left hand side bar with the opening case statement. If the charity has been recently investigated over the past 2 years, it will link to outcomes. A statutory inquiry means the Charity Commission has recently or is currently investigating the charity. This is a big step for us to take in response to concerns about the charity and so does not happen to many charities. Of our 165,000 charities in England and Wales, there are just over 100 statutory inquiries in train at the moment, and after every investigation we publish a statutory inquiry report on our website so you can read the findings. If you have serious concerns about a charity, do please get in touch with us. Are there other sources of information? Yes. When you are a supporter of a charity, you may be sent or want to ask for information about the impact your donation has made; and you can often find out a lot on their website. Some organisations try to assess the impact of charities, particularly around medical and international aid, though many are based in the US. Will the register change in future to become more user-friendly? We are always open to changes and will be making more to our register display in August (for which, check back here) to make it easier to read and understand. We’re keen to get more people to use it. So please do spread the word, and tell us what you would like to know about a charity that you can’t currently find out on our Register!